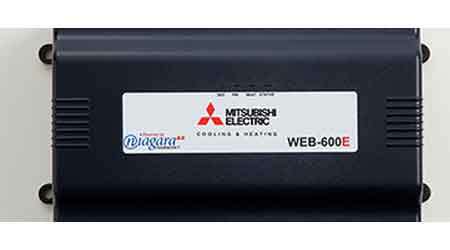 Diamond Controls™ Solutions and the DC-600E™ Integration Controller provide building managers and owners an innovative product-services package that pairs complete building controls with top-notch customer service from Mitsubishi Electric’s Professional Solutions Group (PSG). The combination of a quality product (advanced controls) and versatile service is unique to Mitsubishi Electric’s building management offering and ensures that managers and owners can make the most of their budgets and time. PSG is involved in every step of the integration process, including design, programming, installation, training and follow-up — steps that are typically handled by multiple different contractors. By offering a single, integrated solution through a reliable provider, the DC-600E Integration Controller improves the speed of the integration process and reduces the risk of integration mishaps. HVAC is the largest significant feature that commercial controls systems manage. Choosing controls that are centered on a facility’s HVAC system is the logical choice. Facilities using Mitsubishi Electric’s variable refrigerant flow (VRF) zoning systems in conjunction with the DC-600E Integration Controller can now capitalize on VRF’s energy efficiency, helping save energy and enhancing occupant comfort. • Efficiency gain. Managing VRF zoning systems through Diamond Controls Solutions adds energy efficiency because the systems come with built-in sensors and the controls use the standard cooling and heating building controls best practices. • Lower cost. A manager can use the controls to modify cooling or heating, shut off lights, turn off water features, etc. — all around the facility’s optimal schedule. Alternatively, a manager can schedule setbacks around the weather forecast; Diamond Controls Solutions service can check the ambient temperature conditions and automatically adjust. Working with one company for both the product and service also removes typical frustrations associated with integrating building systems because VRF-specific sequences and programming are included with Diamond Controls Solutions. • Ease of use. Diamond Controls Solutions service can be accessed at any time from any location. Remote access removes the tether of touching a physical thermostat, for example, giving managers full control whenever and wherever needed. Diamond Controls Solutions makes monitoring the facility remarkably simple for facility staff, reducing human error and the time it takes to get results. • Management from A to Z. Diamond Controls Solutions allows building managers to control multiple tenant spaces within the same building, multiple buildings on a site and multiple sites. The controlled systems can come from any manufacturer; an HVAC system from one company can be managed alongside an outdoor lighting system from another company. Diamond Controls Solutions can integrate most any automated feature. • High-level display. The displayed trends, reports and analyses reveal in real time how the building’s systems are reacting to user behavior, building conditions and ambient conditions, offering managers valuable oversight. Displayable trends include: building and space occupancy, CO2 levels, energy generation (solar), energy usage and humidity levels, among others. All of this information is displayed via a secure Web page. Representations of equipment, regardless of manufacturer, are displayed in 3D. • Strong and secure software. Diamond Controls Solutions runs on Tridium’s NiagaraAX Framework software (Niagara). Tridium, Richmond, Virginia, a global leader in open architecture automation software and an independent business entity of Honeywell International, Inc., Morristown, New Jersey, has seen impressive growth for almost 20 years. Niagara is customizable, upgradable and scalable, meaning it can be as simple or advanced as a user wants. The ability to ￼upgrade the framework without replacing components as well as the framework’s unlimited scalability means its operational life will exceed that of the systems it integrates.